I must serve an international quality tea brand with a varied portfolio to maintain my hotel image. SIR THOMAS LIPTON Peppermint is a peppermint herbal infusion tea. 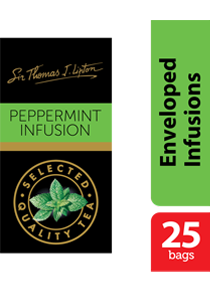 it is cool & minty, a sip of this naturally caffein-free infusion promises to instanly revitalized SIR THOMAS LIPTON Specialty Tea Collection is a distinctive range of specialty teas made from the finest quality tea and herbal infusions. This distinctive range of SIR THOMAS LIPTON specialty teas are offered to establishments with quality in mind. The finest ingredients are sealed in sachets which maintain quality, freshness and ensure consistency of aroma. Place one herbal bag for each person in a cup or pot. Pour in fresh boiling water. Allow to Infuse for 2 -3 minutes.